This will be the last post until I move into my new home, but I wanted to share the lastest layout. I felt the need to scrap a layout of one of my closest friends. She’s been an amazing friend for the past five years, and I just wanted to tell her that. 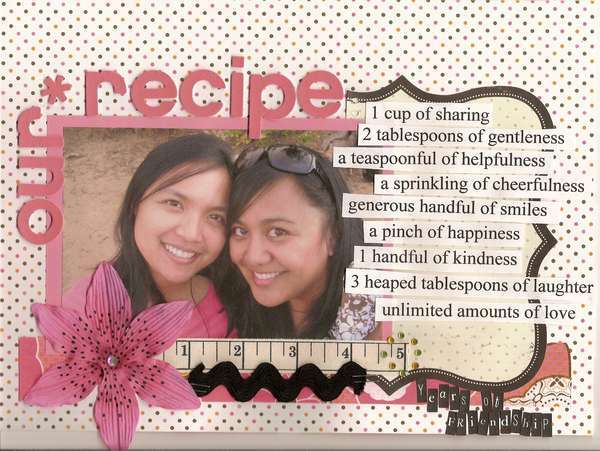 Also, I used the “recipe” idea because she’s a great cook and food fanatic! how sweet of you to make that for your friend. it looks beautiful! your style is awesome. what a great layout, sarah! the flower looks great. That is just gorgeous, might lift the recipe if you dont mind. p.s. I love your scrapbook ideas. mind helping me start a scrap? i haven’t started any yet. looking forward to it. This layout is sooo cute Sarah. I love the recipe idea. Good luck with the move! Very cute, love the recipe. Sweet! Love the photo and the flower, and the colors, and … love it all! Gorgeous page! Hope the move is going well!